Dave Cariello is an accomplished multi-tasker. Originally from Long Island, N.Y., he worked at Campus Connection while a student at Tulane, until he bought the place several years ago. He is managing editor and lead writer for the Canal St. Chronicles, a comprehensive Saints website for everyone in The Nation. Though he is occupied by green, he bleeds Black & Gold. The Canal St. Chronicles has about 3,000 registered citizens and over 100,000 people pass through each month. Whether it is daily scoop, a video library, links to newspapers throughout the Gulf South, players’ pages, or to esoteric diatribes like this one, odds are if it is about ‘dem Saints, Dave has it in inventory. He had caught my eye with a good book review of Sean Payton’s Home Team. Currently, an interview with ex-Saint renegade Kyle Turley is featured. His network, SB NATION, slapped him with media credentials and sent him to Miami for the Super Bowl, of which he showed me pics taken in the locker room from his cell phone. The Campus Connection, where Broadway meets Maple St., has been serving uptown and Fraternity Row with merchandise and apparel for more than two decades. The building was once a neighborhood pharmacy. Being a fan of historical anecdotes, Dave’s place has some juicy ones behind it, involving the first woman pharmacist in the state of Louisiana, a state senator, and a ghost writer (yes! ), the details of which are best left for him to tell. The Connection is stocking A Tale Of Two Seasons as it just begins to get placed around the city. Surfing through the Canal St. Chronicles and dropping by The Campus Connection have something else in common besides Dave Cariello. They are both winners. Nostradamus emailed, saying next week he’d be by, with a look at the ‘Ten Saints. 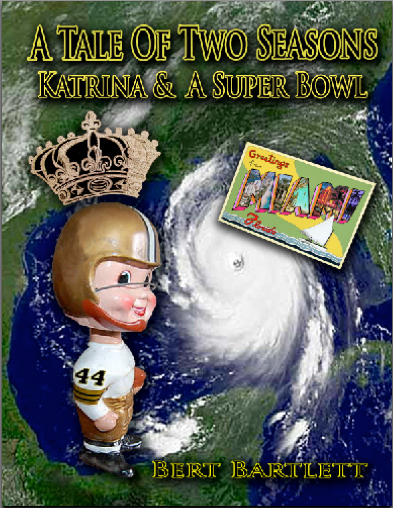 Posted in Uncategorized.Tagged A Tale Of Two Seasons, Black & Gold, Canal Street Chronicles, Dave Cariello, Home Team, Hurricane Katrina, Katrina & A Super Bowl, New Orleans, New Orleans Saints, NFL, Pre-Season, Pro Football, Saints, Sean Payton, The Campus Connection, Tulane University, Write2grow.org/bartlett/. Previous Post David Dixon, R.I.P.